It's hard to believe that Christmas is already over. It seems to have whooshed by, in spite of my no-stress attitude and goal of enjoying the season. One thing that didn't get done that I wanted to do, was to take the girls to drop their letters to Santa off at the Santa mailbox in our town. Since they did get to sit on Santa's lap and tell him what they wanted, I didn't feel too bad. 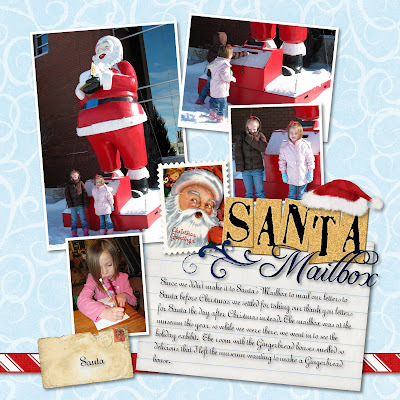 And since the Santa mailbox is always a good photo opp, we decided to take thank you letters to the Santa mailbox instead. That's what we did yesterday. The Santa Mailbox was at the museum this year. There's a Christmas exhibit going on at the museum right now, so we decided to check it out while we were there. We saw lots of Santa collections, nativity sets, and other Christmas collections. It was a nice display. My favorite was the Gingerbread house exhibit. The room it was in smelled exquisite. This is a picture of my favorite Gingerbread house. Here's a view of the back side. And an up close picture. I wanted to touch it so bad, I can't even tell you. I was wrestling with my conscience, "Would anyone notice if I ate just one teensy little shutter?" This was another nice set of houses. And a Gingerbread Teepee. Isn't that the coolest? I'm in the mood to make a Gingerbread house now. I'm going to do it next year, for sure. This is just Stinkerbell on a wooden horse. And Zoe Bug on the same horse. Yesterday we started writing our thank you notes for Christmas. This is the first year that I don't have to help the girls. I just handed them a list of who gave them what, a stack of thank you cards, and I set them loose. My only rule is that they have to write at least one thank you note each day until they're all done. That way it's not an overwhelming task. We also hit the after Christmas clearance sales bright and early yesterday. Well, before noon anyway. We stocked up on goodie buckets for next year's bake-a-thon. We got 50 of them so we'll have plenty next year. And we scored big time on the candy cups. For some strange reason, we had a very hard time finding these this year. The only stores that had them were K-Mart and Target. And if you live in my town, don't bother lookin' cause we cleaned 'em out. Sorry about that. We're hoping 2,000 candy cups is enough to get us through the next couple of years. What a cool place! I haven't seen a Santa's mailbox like that and those gingerbread houses were amazing! I would love to be able to do something like that. You are training your girls right, friend. And what a fun day. I LOVE the gingerbread house that was your favorite. I wanted to do that this year, too....but it didn't happen. Maybe next. The Christmas season isn't over yet. You could still make a gingerbread house. The museum sounds like fun. We love museums! I love the teepee! Last year for my son's birthday we made a cake with teepees and put a huge one up in our backyard! It looked so real and was made out of old tarps! Oh, and the Santa mailbox is soooo cute! wow! love the pictures. those gingerbread houses are divine. i love that you have a santa mailbox. i've never heard of such a thing!